The ID is f26fa8c9bef9 (from first column) and the name is jenkins (from last column). NOTE: You need to adapt the name (jenkins) with the container ID or your name. Your identification has been saved in /var/jenkins_home/.ssh/id_rsa. Your public key has been saved in /var/jenkins_home/.ssh/id_rsa.pub. Now you created your SSH key so you can create the Credential. Then click on “Add Credentials” in left menu. 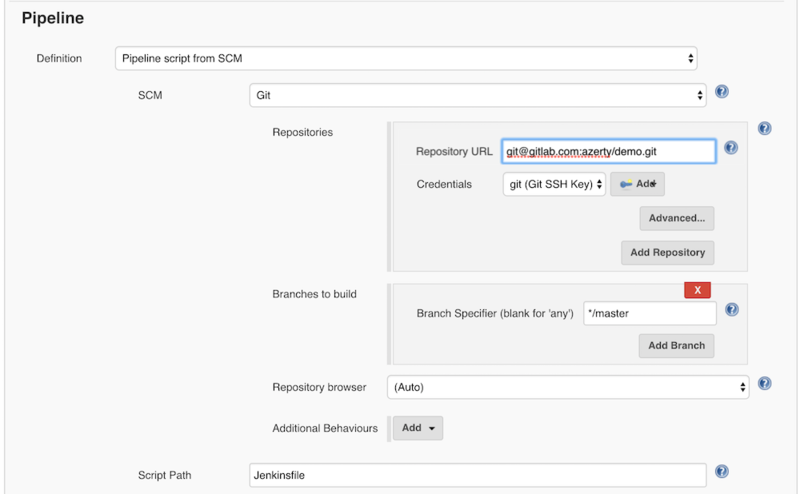 Now you have your ssh key, so go to your gitlab project you want to build with Jenkins, and click on “Settings”, then “Repository”. You can check the Write access allowed if you need it. And it should be able to clone !